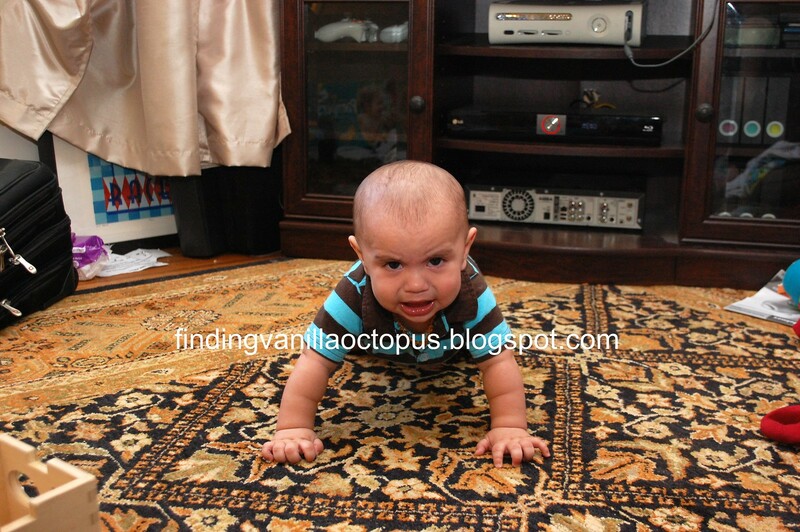 For the last couple of weeks, we've been on Crawl Watch around here. 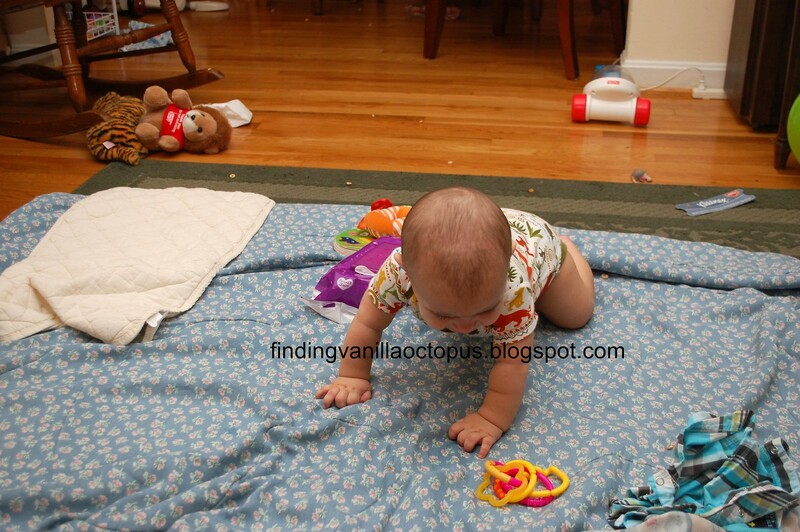 Michael has gotten quite good at getting in position and rocking back-and-forth, a surefire precursor to actually crawling. I learned from Abby's experience that even if it looks like they're just about to "get it," there could potentially be weeks worth of struggle before taking the next step. And struggle, Michael has. I've been trying to get some good pictures of him in the midst of his attempts, but his threshold for patience is pretty low, and disappears entirely when he gets the sense that I'm watching him. Of course, there's no clearer indication that I'm tuned into what he's doing than when I go and get my camera out. He started melting down after I took that second picture, so I called it quits at that point. Here's what happened when I tried again on a different day. Yeah, he wasn't too happy with me. My poor little guy. He just wants to be like his big sister (that's her leg off to the left, there). How mysterious her capabilities must seem to him, now. I've tried to help him in all sorts of ways to ease his desperate frustration, but I know that ultimately, he's got to figure it out for himself. Someday very soon, I'm sure that he will. It will all just "click" for him, and off he'll go. I only wish I knew exactly when that moment were coming, so that I could properly prepare (and have a camera or two ready, of course). How different our lives are going to be; there will be no stopping him, then.